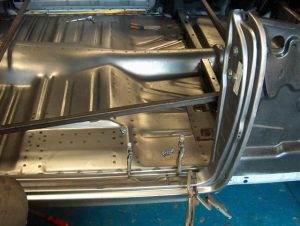 Excellent metalwork skills are required to achieve a perfect fit when replacing auto body panels. With the skills and tools we use in custom metal work, we are ahead of the grade on auto body panel replacement and repair. One of the essential steps in an auto body repair and restoration is stripping away old products such as seam sealer, body filler and paint, along with rust. If these offenders are not removed, they will most likely rear their ugly heads on an otherwise perfect vintage auto body restoration. 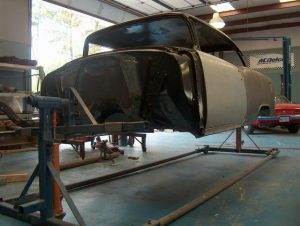 Select Motors uses the chemical stripping and e-coating process to assure your restoration project starts with the cleanest body panels possible. Select Motors knows rust repair and body quarter panel replacement is one of the most critical steps in the restoration process. We take great pride in producing rust free bodies. 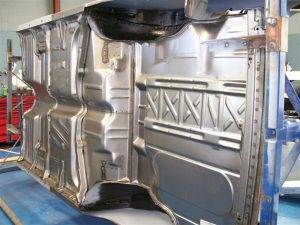 We do this by first Chemically Stripping and E-Coating the body and body panels. This is our method of choice because good metal remains undamaged and is not weakened by the process. 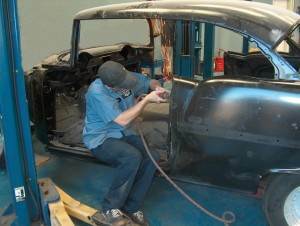 In this process, all old paint, body filler, rust, seam sealer and foreign materials are stripped away. Only after the metal stripping process does it become apparent which panels should be repaired or replaced. Panels damaged by the rot and pitting caused by the existence of previous rust must be cut away. Our technicians cut out the weakened or rotten panels before welding new patch panels. If new panels are not available on the market, our custom metal fabrication professionals will fabricate the necessary replacement. Select Motors takes great care to ensure the original integrity of the body remains to provide an excellent surface for proper panel alignment and to ensure a solid base for a quality paint finish.